March 08, 2011 14:00 ET | Source: Saia, Inc.
Saia, Inc. is a less-than-truckload provider of regional, interregional and guaranteed services covering 34 states. With a network of 147 terminals, the carrier employs 7,500 people. 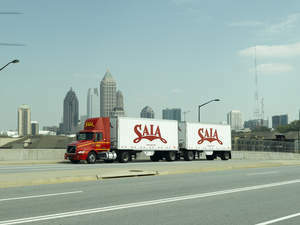 JOHNS CREEK, GA--(Marketwire - March 8, 2011) - Saia, Inc. (NASDAQ: SAIA) announced today that it is launching a new Customer Service Indicator (CSI), exception-free delivery. This newest metric will measure the percent of shipments that are delivered without a noted exception. Saia is the only carrier in the less-than-truckload industry to report on this critical measurement. It has been over a decade since Saia launched its innovative indicators that have been the basis for the company's ongoing service improvement record. The addition of the exception-free delivery metric is the latest development in the evolution of the program, which is built on customer expectations. "Saia's success is our ability to provide solid service to our customers based on the areas they feel are key to their needs," said Sally Buchholz, Saia's vice president of marketing and customer service. "While our CSIs measure Saia's performance, they also are a valuable tool our customers can use to analyze their shipping results. It really is a true partnership between our shippers and us." The CSI program is the result of extensive research during which Saia asked customers what information they needed to make their transportation buying decisions. Based on their feedback, the company developed the CSIs, which measure the key metrics customers said were most important to them. In addition to exception-free deliveries, the CSIs include pick-up performance, on-time delivery, claims settled within 30 days, claims-free shipments, and invoice accuracy. "The CSIs remain exclusive to Saia and exception-free delivery builds on this notable history," explained Buchholz. At the end of the fourth quarter, Saia posted 97.1 percent on-time service and 99.6 percent pick-up performance. Saia's exception-free delivery performance for February 2011 was 98.6 percent. Saia, Inc. (NASDAQ: SAIA) is a less-than-truckload provider of regional, interregional and guaranteed services covering 34 states. Saia is home to the industry-leading Xtreme Guarantee product, which guarantees total customer satisfaction from pick-up through invoicing. Saia offers complete North American coverage through partner agreements. With headquarters in Johns Creek, Ga., and a network of 147 terminals, the carrier employs 7,500 people. For more information on Saia, visit the Saia Website at www.saia.com.